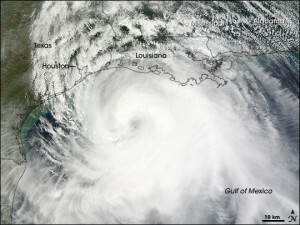 Satellite imagery of Hurricane Ike (courtesy of NOAA). What can weather history teach us? Quite a bit if you talk to Sarah Jamison, a Cleveland, Ohio, based hydrologist with the National Weather Service. Sarah’s what I call a “weather storyteller” — she’s the expert I sought out while researching the strange meteorological events that led to the1913 Dayton flood – a key setting for my up-and-coming historical novel, Torrential. “The Weather Bureau offices for Indiana and Ohio on the morning of March 24, 1913 were calling for ‘unsettled weather, with rain or snow that night and colder Tuesday,’” Sarah said, referencing historical records during our background interview for my novel. Of course, what happened over the next 24 hours has gone down in National Weather Service history: a combination of two high-pressure systems created a stream of moisture from the Gulf of Mexico that stalled right over the Ohio Valley, leading to intense rainfall – the equivalent of six months of runoff in two days. Some nine to 11 inches of rain fell that Easter weekend on ground already saturated from an early spring thaw. The torrent proved too much for the city’s levees, which broke early on the morning of March 25, and catapulted the city under up to 24 feet of water in places. The disaster cost Dayton more than 360 lives, and property losses of $100 million, or more than $2 billion in today’s dollars. 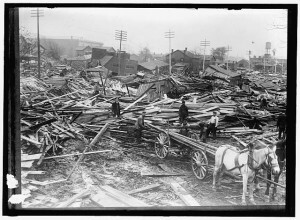 Damage from the 1913 Dayton flood. The flood that laid waste to Dayton wasn’t the end of Ohio’s weather woes. In November of that year, the Great Lakes were struck by a massive storm system combining whiteout blizzard conditions and hurricane force winds. The centennial of the storm, known as the “White Hurricane of 1913,” is this Saturday. It lasted for four days, during which the region endured 90-mile per hour winds and waves reaching 35 feet in height. She’s often called to document details of past storms for anniversaries – her first such project was the 10th anniversary of Hurricane Floyd that devastated North Carolina. We crossed paths when she worked on the Dayton flood centennial (see blog post marking this event). Sarah’s passion for informing the public of historical weather disasters serves many purposes, most significantly, “retelling the stories of these historic disasters helps remind people of their vulnerabilities,” says the Florida Institute of Technology meteorology graduate. 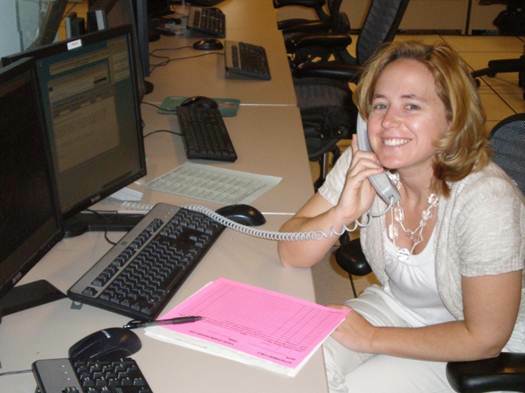 Sarah began her National Weather Service career in Portland, Maine, in 2002. She has since worked at the forecast offices in Kansas City and the Outer Banks of North Carolina before being based in Cleveland in 2010. 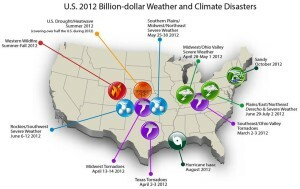 Sarah, along with her colleagues in climatology, concur that we are experiencing more extreme weather disasters from floods to droughts to hurricanes and tornadoes (The Writing Well previously addressed the topic of extreme weather when it featured award-winning science journalist Linda Marsa, author of Fevered). In 2012, weather and climate disasters cost the U.S. $110 billion, with Hurricane Sandy alone causing damages of $65 billion, NOAA reported. Often in these storms, loss of life is due to people not recognizing that they are in a life-threatening situation. Sarah and her National Weather Service colleagues are now collaborating more closely with public and private agencies to promote public safety and preparedness in the face of devastating storms. The group, Silver Jackets, was launched during the centennial of the Great Dayton Flood. It leverages the resources and manpower of dozens of agencies. As I watch news headlines of the impending land fall of Super Typhoon Haiyan, predicted by some to be the largest storm ever recorded, over the Philippine Islands, I can’t help being thankful that the US is marshaling its resources to build a more coordinated early-warning platform here. As for Sarah, she’s already looking ahead to the next opportunity to educate the public. NOAA and the National Weather Service are sponsoring “Storms of the Great Lakes” exhibit at the Great Lakes Science Center on the Cleveland waterfront mainly to pay tribute to the “White Hurricane” of 1913. Sarah also is gearing up for the anniversary of Hurricane Hazel. Unfortunately (or fortunately) for this history-minded hydrologist, there are no shortage of regions in the country from which to find weather disasters. 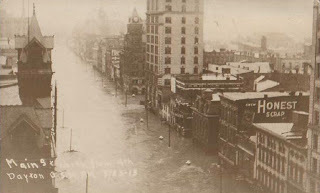 This entry was posted in Book Research, Storytellers and tagged Dayton Flood of 1913, lessons of storms, National Weather Service, Sarah Jamison, Silver Jackets, storm anniversaries, weather storyteller on November 7, 2013 by AnneWainscott. The April 2, 1913 edition of The Dayton Daily News. 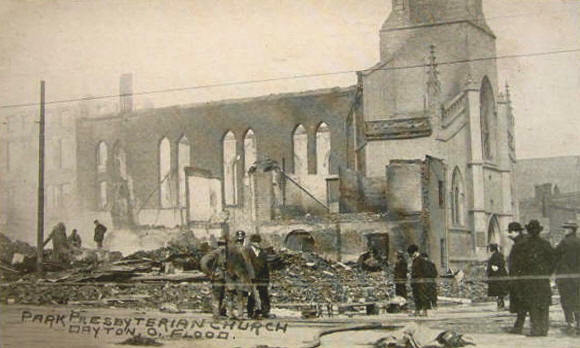 One hundred years ago today, my hometown experienced its worst-ever natural disaster. 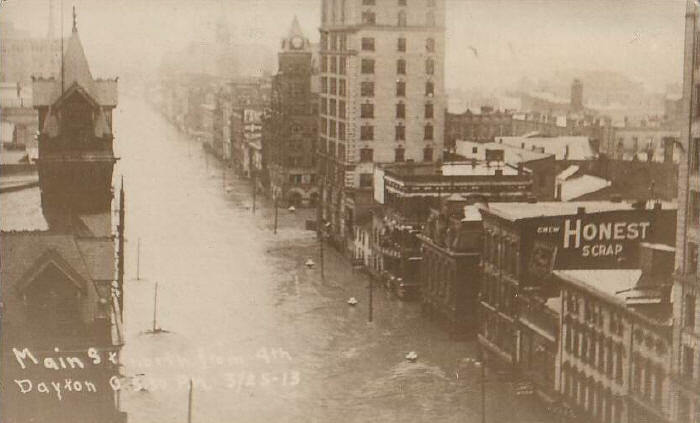 On March 25, 1913, unprecedented storm systems and resulting rainfall caused Dayton’s Great Miami, Mad and Stillwater Rivers to flood, laying waste to the city. Some nine to 11 inches of rain fell from March 23-25 on ground already saturated from an early spring thaw. By the time the waters — which reached as high as 24 feet in some areas — receded a few days later, more than 360 residents and 1,400 horses and mules had perished. Entire blocks were decimated from water and out-of-control fires. The region’s losses totaled $100 million, or more than $2 billion in today’s dollars. My grandmother, Emma Wainscott, was only five years old when the flood waters swamped her family home on Van Buren Street. Within hours, the house took on 13 feet of water, leaving the family marooned on the upper floor of their two-story home. She watched as men in NCR flat-bottom boats rescued her elderly neighbor from an upstairs window. Before it was over, National Cash Register had built 300 boats used in rescue efforts. My grandmother’s recollections inspired my soon-to-be completed novel, Torrential. My narrative opens on Good Friday, with a group of Dayton boarding house residents living on Van Buren Street (an area known today as the Oregon District). Technically a work of historical fiction, Torrential nevertheless features many colorful true characters, including John H. Patterson, NCR’s indomitable founder, and Arthur Morgan, the son of a Minnesota surveyor, who devised Dayton’s permanent flood-control solution. Patterson, a man who knew about Dayton’s tendency to flood from his youth collecting tolls for the Miami and Erie Canal, galvanized his factory into a massive relief operation. His quick actions saved the city from an even more significant loss of life. Patterson had a lot on his mind that spring — five weeks earlier he and other company officers had been convicted of Sherman anti-trust violations and faced a year of jail time. I began my book research last spring when I stayed in the Oregon District, a block from my grandmother’s childhood home. In addition to a visit to NCR’s Historical Archives, I interviewed the chief engineer at the Miami Valley Conservancy District, one of the U.S.’s first major flood-control districts and the brainchild of Morgan. I have since interviewed two of his grandchildren, including Faith Morgan, executive director of the Arthur Morgan Institute for Community Solutions. She described her grandfather as an avid outdoorsman with a strong sense of right and wrong, who analyzed problems from all angles. Sarah Jamison, a Cleveland-based National Weather Service meteorologist, detailed for me the rare weather systems that converged to cause the widespread flooding on that long-ago Eastertide. She noted that on Good Friday a severe wind storm with gale-force winds hit Dayton from the Great Lakes. 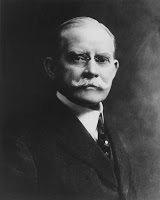 On March 25, Ohio Governor James Cox declared Martial Law in Dayton, appointing Adj. General George H. Wood as the city’s military governor. Interestingly, Wood, a Dayton native who eventually would command 3,000 Ohio National Guard troops, had as his base of operations NCR Building No. 10. Many people today don’t realize that back in 1913, there was no flood insurance or FEMA. Americans hated the idea of accepting charity, as noted by NCR employees who rejected Patterson’s offer of a free hot lunch; they insisted on paying for their meal. Within ten days of the disaster, Daytonians, many reeling from their own losses, raised $2 million for a flood prevention fund. When the American Red Cross arrived on the scene to help care for the stricken residents, staff were so impressed with the city’s dignity and perseverance that they lowered their flag as a sign of respect. Torrential carries readers through the flood and the rebuilding of Dayton, including the remarkable work of Morgan. At its essence, Torrential is a love story — told through the eyes of two main characters — Hannah, the boarding house’s eldest daughter, and Kieran, an Irish boarder working for his uncle at NCR’s Wood-Working Department. Along the way, another kind of love story has emerged — one of a city’s indomitable spirit in its darkest hour. Anne Wainscott-Sargent anticipates completing her historical fiction novel, Torrential, in 2013 and will be seeking a publishing home for the book. Check back at this blog often for details on her experiences bringing Dayton’s worst natural disaster to life on the page. Round-up of flood awareness events compiled by the Silver Jackets, a collaboration of federal and state partners working to anticipate and reduce risks related to flooding and other natural hazards. Dayton Daily News article about how library exhibits throughout Ohio are commemorating the flood. This entry was posted in Book Research and tagged 1913 Dayton Flood, historical fiction, John H. Patterson, NCR, writing on March 25, 2013 by AnneWainscott. #1 Read as many books in your given genre as possible before you tackle your book. 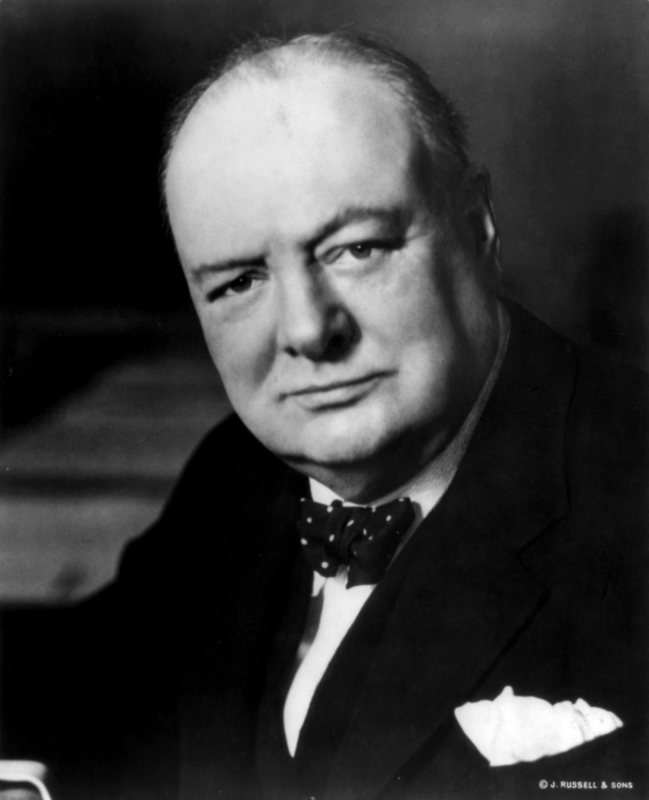 If you are focused on a period piece, read letters, official records and books of that period. Reading also will help you capture the language of your characters more realistically. 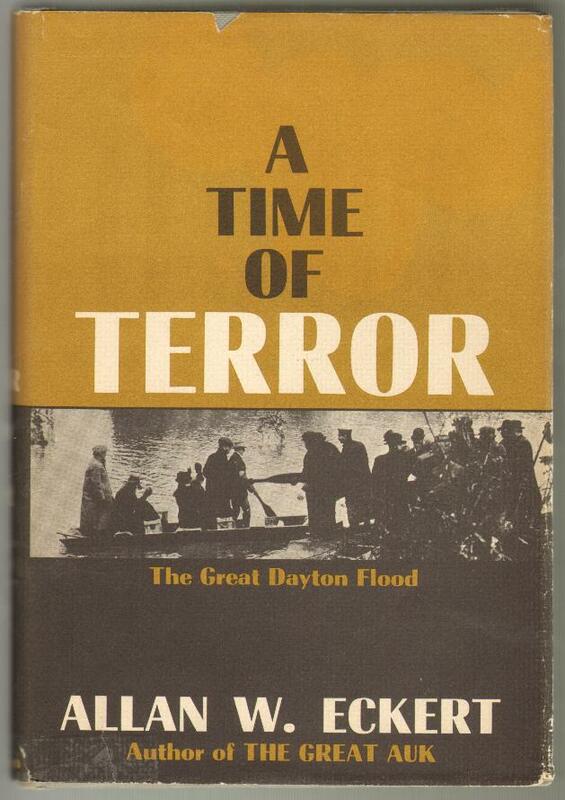 I’m in the middle of researching the turn-of-the century in Dayton, Ohio, on the brink of a great flood. I just finished the definitive book on that tragedy and I also spent time at a corporate archive where I scoured newspaper accounts of the tragedy and letters from eye witnesses caught up in the flood. #2 Interview sources. I love this part of research probably because I interview people for a living. I always enjoy talking to individuals from all walks of life and learning something new. My first book, a memoir that told the stories of 19 mothers and daughters separated too soon from smoking-related illnesses, involved me interviewing the surviving daughters and one mother. I took a documentary, first-person storytelling approach setting the stage for each chapter with the circumstances of each daughter (or mother’s) life. My book wouldn’t have been possible without primary interviews. But even with my historical fiction project I am relying on interviews because the story details actual events and includes public figures who played integral roles in the flood response. I interviewed a long-time Dayton Daily News columnist, whose grandparents were caught up in the flood and who has written about the flood for three decades. I also consulted with the chief engineer at the Miami Conservancy District, legislatively established in the aftermath of the Great Flood as part of the city’s permanent flood control response. #3 Establish place. Visit the location of your book — if it’s your own backyard in the north Georgia Mountains or a family lake house, good. You don’t have to travel far! But, don’t take shortcuts and think you’ve captured the unique flavor of your book’s locale if you haven’t experienced it. If your setting is an old boarding house, stay at one (find a B and B with the original mason work and creaking floors). Author and writing coach Jedwin Smith advised me on my trip back to an old house in Dayton’s historical district to look at the direction in which the sun rises and sets, to study the texture of the walls and the wood, and to memorize the views from each window, especially those on the upper level. If your setting is a period house, go room to room and close your eyes and try to imagine what the room felt like back during the time of your book — what kind of furniture was there? What the lawn was like—figurines, shrubs, flowers, the car that would have been parked outside? My great grandparents’ home in downtown Dayton during the turn of the century. “Whenever visiting historical sites, I always allowed myself to step back in time; imagining what I would have done, how I would have felt. This helped greatly, for no matter how much time has elapsed between the event and today, emotional reactions are pretty much the same. So in that regard, trust your heart and your instincts,” Jedwin says. If your book is set in another realm, establishing place is very much an exercise of your imagination but still you need to draw on inspiration from reality. This entry was posted in Book Research, Writing Resources and tagged Historical fiction research tips on May 15, 2012 by AnneWainscott. 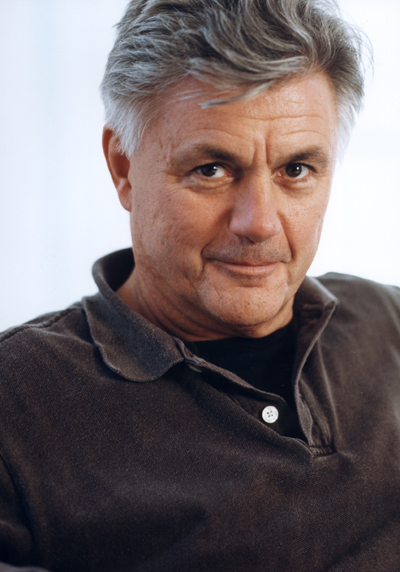 I read a profile on John Irving last night in TIME. The American novelist, who penned his first novel at age 26 in 1968 and went on to write bestsellers, The World According to Garp and The Cider House Rules, has been called a contemporary Dickens. He’s not afraid to tackle tough issues – from sexuality and abortion to AIDS. On Tuesday, his newest novel, In One Person: A Novel, comes out. This novel is an intimate and unforgettable portrait of the solitariness of a bisexual man who is dedicated to making himself “worthwhile.” The story covers the decades of the 50s, 60s and 70s. Irving, who has a grown gay son, had already been researching the book before his son’s orientation was known. “Research has always been an essential part of Irving’s writing process,” TIME reporter Benjamin Percy states in the article. To illustrate, he shares how Irving did research for the restaurant scenes in his book, Last Night Twisted River, about a father and son set in a sawmill mining camp, by spending hours observing the cooks at one of his favorite restaurants, Pastis, in Toronto (Irving spits time between Toronto and Vermont). He also uses flashback – forward and back – avoiding telling the story chronologically. A view of downtown Dayton ‘s Main Street from 4th on March 25, 1913. Both of these points are helpful as I think about my first historical novel that will tell the stories of a group of fictional Daytonians caught up in the 1913 Flood. I spent part of my Spring Break this year in Dayton researching the flood and the key figures who played heroic roles during and after the catastrophe. Fortunately, I have many rich resources to draw upon as I try to recreate the sense of place and people of my hometown at the turn of the century. 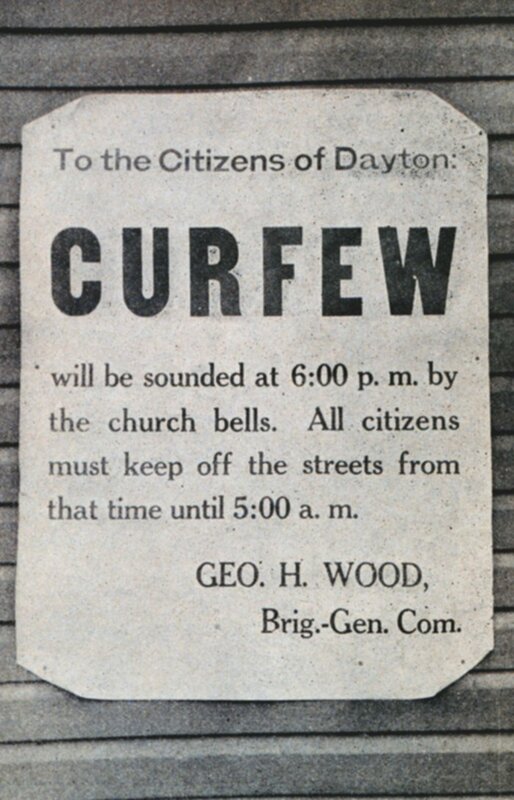 Dayton at that time was a dynamic place to be…home to the likes of the Wright Brothers, who first took flight; Charles Kettering, who invented the automobile self starter; and John H. Patterson, founder of the National Cash Register Company, who overnight turned his company into a massive rescue operation for Dayton’s community in its moment of greatest peril. The Dayton Engineering Club provides bio sketches of some of these “giants” on the Dayton Innovation Legacy website. The one drawback was that the city was prone to flooding, and during that unseasonably warm spring, three great air masses converged to set the stage for disaster. Flashback also will be a helpful technique for my book. The setting for most of my story will be a stately boarding house in Dayton’s present-day Oregon District. A family with two sisters nearly 10 years apart lives on the first floor (soon to be under 13 feet of water), while a handful of boarders reside in rooms on the second floor. Many decades later, the younger sister, now in her 90s and confined to a wheelchair in a Dayton nursing home, remembers her beloved sister on the anniversary of the great flood, when her college-age granddaughter comes visiting. From there the grandmother shares the tale of destruction, heroism and sacrifice that occurred in her community on that long-ago Eastertide. This entry was posted in Book Research, Writing Tips and tagged flashback, John Irving, research and the writing process on May 5, 2012 by AnneWainscott.